Juki HZL-K85 is a quality sewing machine for advanced sewers. The price is a little bit on the higher side though. Juki HZL-K85 is a computerized sewing machine. 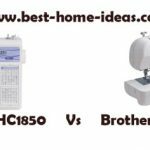 It is a compact looking sewing machine loaded with lot of features. It is designed with advanced sewers in mind. It comes with a hard case as well. The machine is pretty light weight at just 16 pounds. It has memory function with which you can program the machine to needle up/down and the machine will remember the position of the needle. It has a heavy duty metal frame. 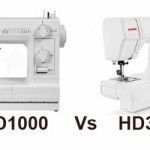 Juki HZL-K85 has top-load drop-in bobbin system. It comes with 150 built-in stitches. This machine can sew at a speed of 750 stitches/min, which means it has a powerful motor inside. You can sew without using the foot pedal by just pressing the start/stop button. It has free arm sewing capability as well. 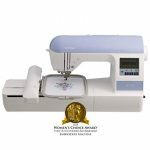 It has LED work lights which are not so bright, you might need some extra lighting to sew. It has automatic tension as well. 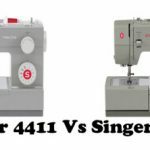 You can easily adjust the stitch length and width with the push of a button. 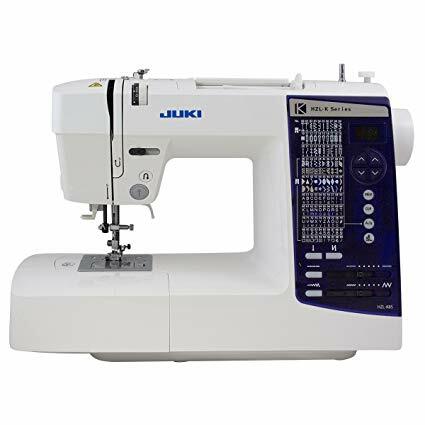 Juki HZL-K85 has a maximum stitch length of 4mm and stitch width can be set to a maximum of 7mm. Juki HZL-K85 has two automatic lock stitches, which will automatically lock the stitches at the beginning and end. The built in needle threader will quickly thread the needle for you. The user manual that comes with Juki HZL-K85 is one of the best I have seen in a while. All instructions are clear and detailed. It also includes an instructional DVD. This sewing machine does a wonderful job with multiple layers of denim. It sews through leather without any problem, no skipping of stitches or anything for that matter. The stretch stitches are also pretty good. The machine is easy to thread. Letters and numbers come out perfect, giving a professional finish. The stitch number panel looks a little bit crowded. The LCD display is just plain. Push buttons are smaller than that you normally see on other sewing machines. 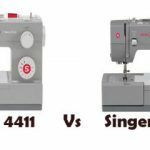 Overall, Juki HZL-K85 is a compact, small sized, solidly built and easy to operate, computer controlled sewing machine. Yes, it is an expensive machine, but it performs like one. The quality of the machine is worth the price. You can consider this machine if price is not a big factor for you.